Our kiddos have been gone this week and rather than do a bunch of projects, we have been laying low all week. I now know that if I didn't have children, I would be taking more naps, eating at weird times and watching Netflix until I got the "Are you still watching?" shame prompt. Yes Netflix, I've been watching Parks and Recreation for three hours. Shut your pie hole! Probably good I have those two little kids to keep me on schedule. Last week I did a fun project from a thrift store find. I found this old lamp for $5.00. The lamp was pretty ugly, but it was seriously heavy duty. I figured since it was heavy it was the perfect lamp to try a Pinterest idea I've been thinking about for a while, an outdoor solar lamp. 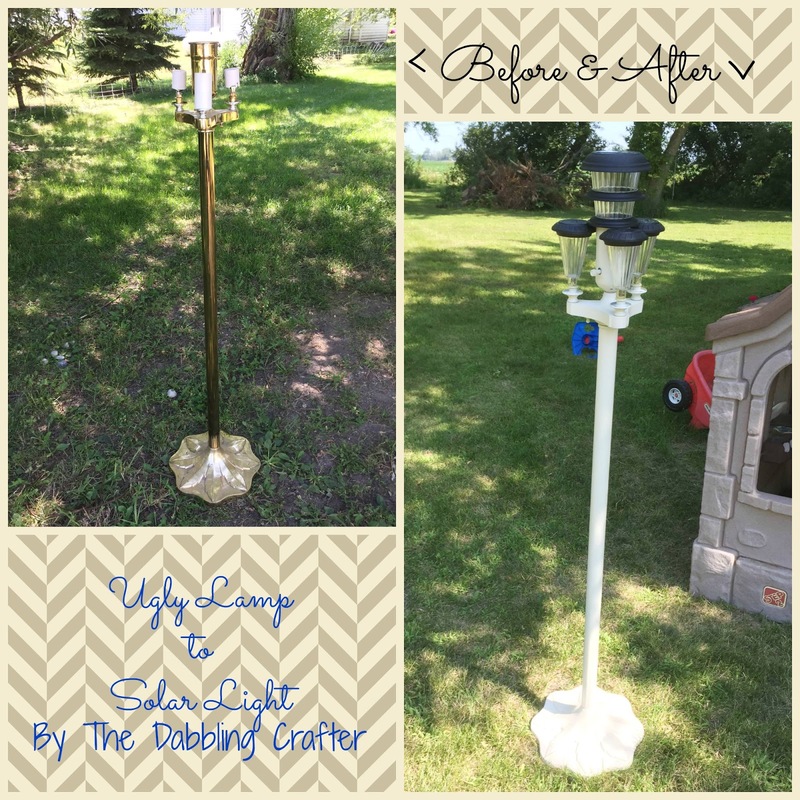 It would be a great project to put on a patio for a little extra light. I used the lamp as a street light in front of my daughter's play house. This project will be a bit different for each type of lamp. The first thing I did was spray paint the lamp. I had to remove the light bulb part so my smaller lights would fit under the large light I picked out. I attached each light to the lamp using gorilla glue. It's perfect because it's rated for exterior use and it expands in the gaps. This is the before. Not much to look at. The lamp post is perfect on our patio as well. The perfect lamp to go in front of our little play cottage.